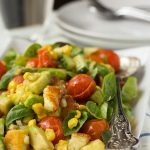 You might think you don’t need a recipe for a tuna salad, especially an easy tuna salad, but I really wanted to share this one with you. It’s healthy, delicious, extremely quick, and looks quite impressive, don’t you think? I know what you’re thinking. Who needs a recipe for a tuna fish salad? Well, I guess you’re right – you don’t. 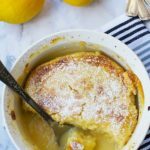 But one of my favourite types of ‘recipes’ to post are those that hardly need a recipe. Because if you’re like me it’s sometimes IDEAS you need. What to have for dinner when you’ve got precisely zero time to shop that day and a maximum half hour to get the meal on the table. Mr. Scrummy and I (and now little Benjamin, although we aren’t at the stage yet where he’ll share a salad with us, sadly) have been having this easy tuna salad for dinner regularly for a couple of years now. 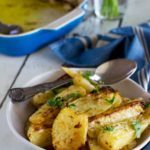 We started off having it on warm summer evenings, but now it’s in our regular meal rotation all year round. And in fact Mr. Scrummy says he’d be quite happy to eat this meal every single night! I’m not sure how long it would take for him to get bored of it if he did do that, but it really is VERY GOOD. And trust me, it’s the simplest thing. 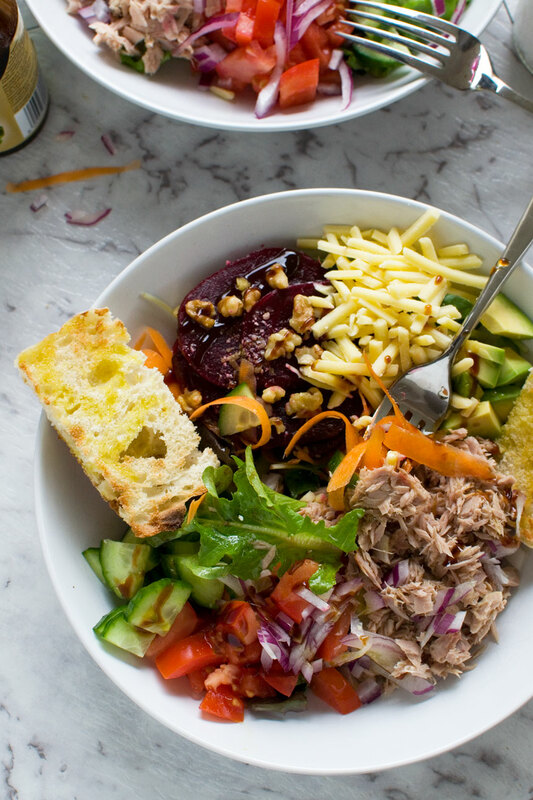 As long as you have a can of tuna fish in your pantry, you can make it with salad ingredients that you’ve probably got in your fridge most of the time. Until now I haven’t thought of sharing it with you, but I figured that if we eat it so often – at least once every two weeks – maybe some of you would appreciate the idea, too. 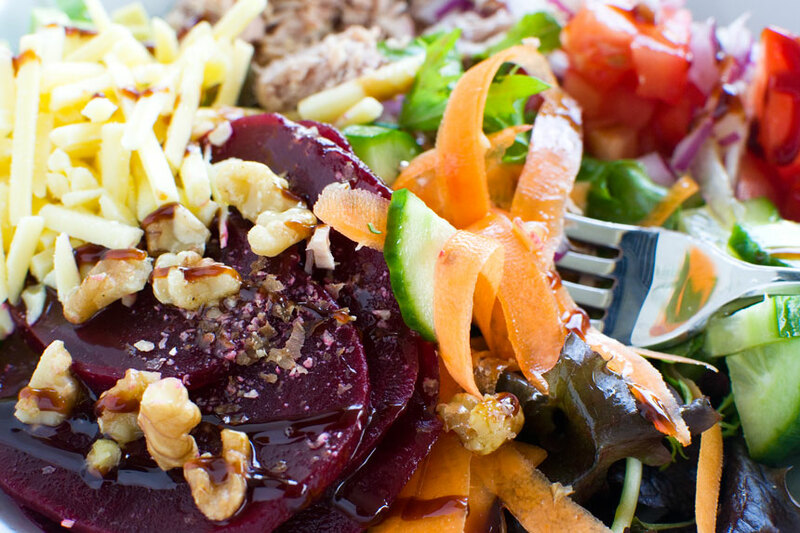 TIP: I particularly try to make sure I always include the cheese, nuts, avocado and beetroot. Not sure why, but If one of these is missing from my tuna salad, it just doesn’t seem QUITE as delicious. But the beauty of this tuna salad is that if you don’t have one or two of the ingredients it really doesn’t matter. I’ve missed out things before because I don’t have them in my fridge at the time and included extra things sometimes too. To keep the salad super super simple, I always just drizzle over a bit of olive oil and some balsamic glaze. I don’t feel like I need a more complicated or heavier dressing. Occasionally I even forget to add any dressing at all, and to be honest I don’t really miss it. Oh, I do tend to add a bit of mayonnaise to my bowl, though. I find it goes really well, especially with the tuna! I always serve it with plenty of toasted crusty bread with olive oil and sea salt. I never mix up the ingredients. I start building my salad with a couple of handfuls of fresh green leaves, then add the rest of the ingredients in little piles. I just think it looks prettier and tastes better this way. And that in my mind is the best tuna salad recipe – one that you can throw together in 5 to 10 minutes, depending on how fast you grab things out of the fridge and throw them in the bowl. It really doesn’t matter if you don’t have one of the ingredients you can see here in the photos. Make your own version and it will still be pretty, healthy and delicious. This is also a surprisingly filling meal. 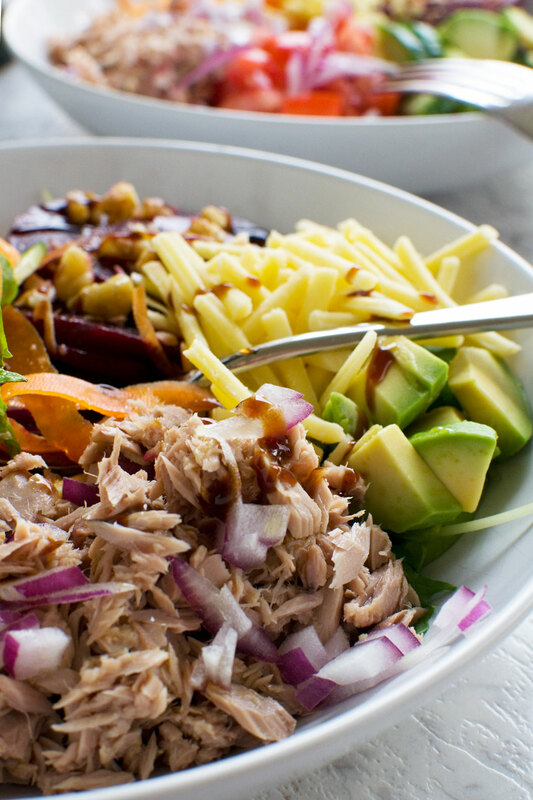 You only need a little bit of each ingredient to make a gigantic tuna salad! 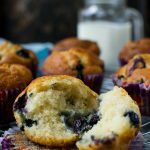 Don’t forget to watch the how-to video below the recipe! 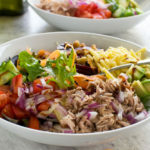 If you hate canned tuna and are reading this far (which I doubt, but just in case… ), of course you could substitute the tuna for rotisserie chicken or thin strips of steak for an equally as quick and delicious salad. 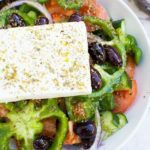 I actually can’t believe I wrote such a long post about a simple salad like this one. I guess I really do think it’s that good. 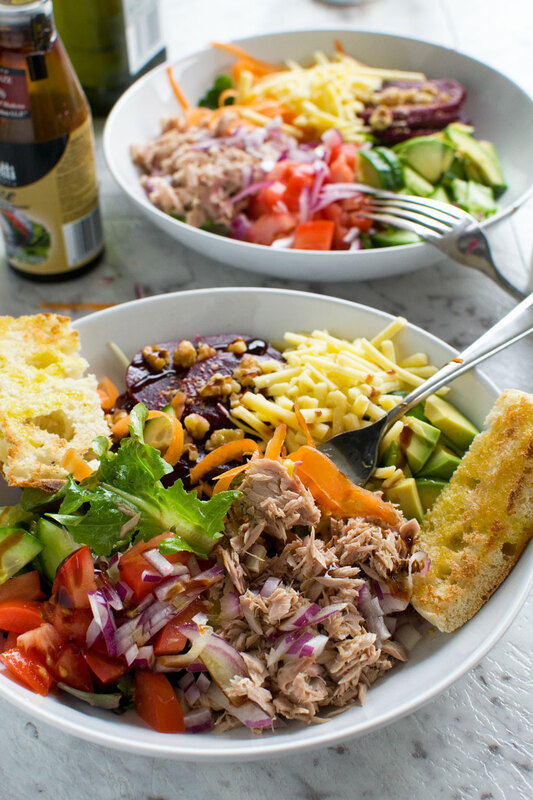 I hope you try making this simple tuna salad for dinner one day soon! If you do, let me know in the comments below what you thought. 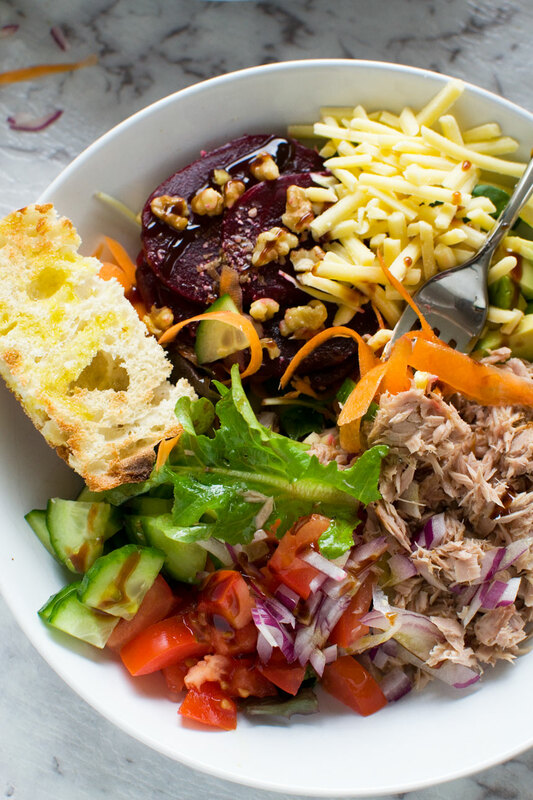 Maybe it will become your favourite tuna salad, too! This pumpkin, chorizo and feta salad is full of umami flavour, and suitable for a quick and easy main meal any time of year. There’s a reason I’ve been making this easy tuna salad week after week for years. 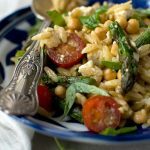 It’s healthy and delicious and made with the simplest of salad ingredients that you’ve probably nearly always got in your fridge. 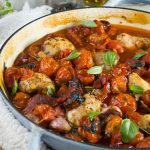 Try it – I don’t think you’ll be disappointed! Start by placing the fresh green leaves in the bottom of 2 big wide bowls. 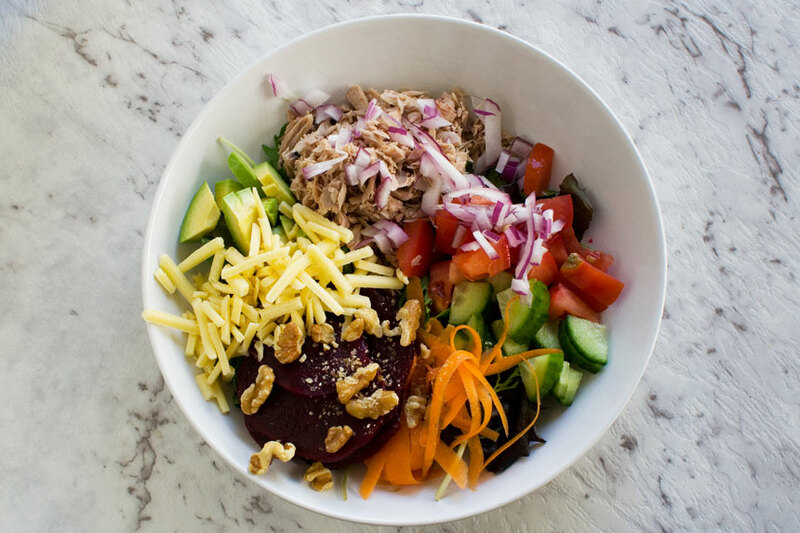 Divide the tuna between the 2 bowls, then add all the other ingredients (apart from the walnuts and onions) next to each other in little piles. Scatter the onion over the tuna and the walnuts over all the ingredients in the bowls. Drizzle over the olive oil and balsamic glaze. Serve with the toasted bread and mayonnaise (if you like). 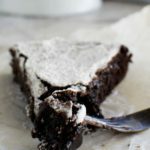 This recipe is only a guide, of course! Don’t have any carrots or cucumber? No worries, just throw in something else that you have got, like sundried tomatoes or a few slices of apple. 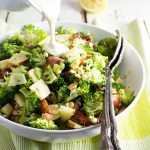 I often vary the exact ingredients and amounts in this recipe, but I always try to include some kind of cheese, avocado, beetroot and some kind of nut for maximum deliciousness! Of course, you can use balsamic vinegar (or a different kind of vinegar or dressing) instead if you don’t have balsamic glaze. Another idea for my tins of tuna, on the menu for tomorrow! . Thank you. Hello Ann, lovely to hear from you! I’m so happy you appreciate this idea. Seriously, we love it and actually I’m making it again for dinner tonight. Even though it’s winter we still enjoy it with some warm crusty bread. Hope you enjoy it too! Aw thanks, April – a compliment indeed! Tuna Salad is a staple in our house too! I love the way you kept it fresh and easy with plenty of vegetables and greens. I usually include a hard boiled egg with mine too and I’d definitely add the chick peas. It’s always nice to see an easy recipe like this to refresh our dinner menus. Thanks. 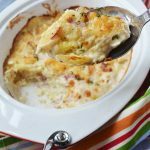 Oh yes – egg! How did I forget that! I’ll add it to the ideas in my post, Linda. Thank you!